[by Nick, discontinued] IT’S TIIIIMMMEEEE for my first ever Friday Night Fight! What better way to celebrate National Peach Month than with a fight between two peach frozen greek yogurts. Tonight’s competitors are both relative newcomers to the freezer isle. In my opinion, peaches are one of the most underutilized mainstream fruits when it comes to frozen desserts. Besides Ben & Jerry’s Peach Cobbler and Haagen-Dazs Spiced Peach Crumble, no other flavors come to mind. I’m glad to see that they’re getting some love with this greek frozen yogurt trend though. Time for the introductions! 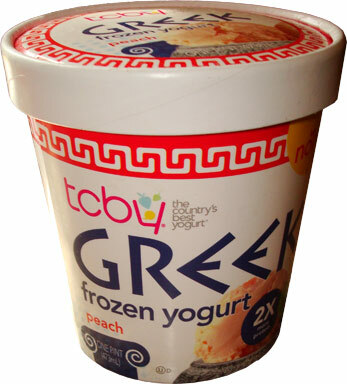 In the left corner, weighing in at a light (non-fat) 100 calories and 6 grams of protein per 69 gram serving is TCBY Peach greek frozen yogurt. 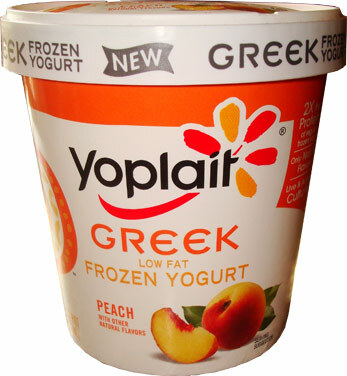 In the right corner, coming in at a hefty (low-fat) 130 calories and 7 grams of protein per 89 gram serving is Yoplait Peach frozen greek yogurt. With their lids off, both of them look like every peach yogurt I have ever seen. They lack the deep orange color of the flesh of a peach. To be honest, they’re both quite dull looking. 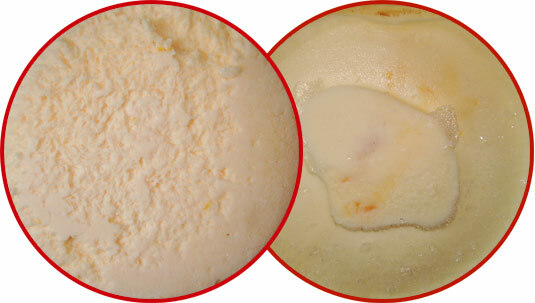 Yoplait (on the right) is duller in appearance but only by a little. TCBY has a slight bit of iciness to it. That’s to be expected from a non-fat product though it still manages to have a decent amount of creaminess. There are bits of peaches throughout but they don’t add much besides a slight change in texture. I’m impressed that none of the peace bits are icy though. Yoplait is creamier and that’s to be expected out of a low-fat product. There are little bits of peaches like in the TCBY pint and they act that same. Once again the fact that these peaches aren’t icy amazes me. 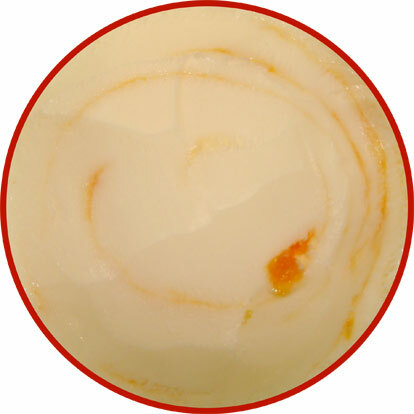 There’s also a peach swirl but that does nothing for the texture. The main difference between these two is that this flavor has the same chalky mouth feel I’ve experienced in the other Yoplait Greek pints. Just like its color, TCBY’s flavor can best be described as dull. It’s like they thought that the flavor of peaches was too strong and decided to water it down. The only time when you get a good burst of peach flavor is when you run into those little peach bits. Yoplait on the other hand has a more pronounced peach flavor. 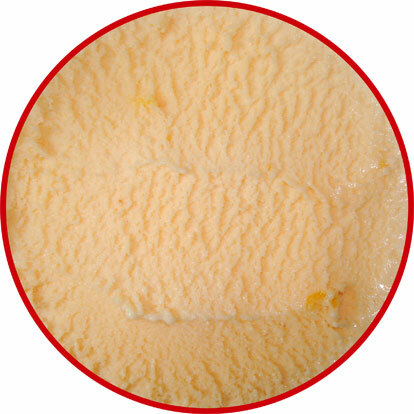 Unlike TCBY where you’re relying on the peach bits to add more flavor, you have both peach bits and a peach swirl mixed throughout the pint. Both elements add a pleasing sweet peach flavor that complements the greek yogurt base. And the winner by a long shot is… YOU GUYS! Even though the peach frozen dessert market is slim, I can’t honestly recommend buying either of these. Now if there was a way to take the positives from both brands and create TCBYoplait then I’d be all for it. As is though, neither one is worth your hard earned dollar. If you need a peach fix, I recommend picking up one of the two flavors I mentioned in the beginning of this fight. Where did you get the TCBY frozen yogurt pint? All of the grocery stores in our area have stopped carrying their frozen yogurt and I miss their Supreme Cookies and Cream. Plus, I never got to try the chocolate chip cookie dough or the toffee ones either and I wanted to try them. Do you know if these have been discontinued? Uh oh, tcbygrocery.com is gone and the social media sites are neglected... maybe the rollout didn't go so well. I've only seen these at Market Basket recently and now that you mention it, I havent seen them restock in awhile. @Stride: I believe they go rid of their normal frozen yogurt line in pint form for these new greek flavors. I have seen the normal froyo in 48 oz containers though. TCBY products seem to gone from my location also...I figured they were discontinued.